1. What is practical completion? Practical completion is when a project is ‘practically complete’, in the sense of the works being capable of being used, as distinct from when they are completely finished (with all defects rectified). In terms of the first component, it is important to note that all three requirements in paragraph (a) of the definition of ‘practical completion’ must be satisfied. 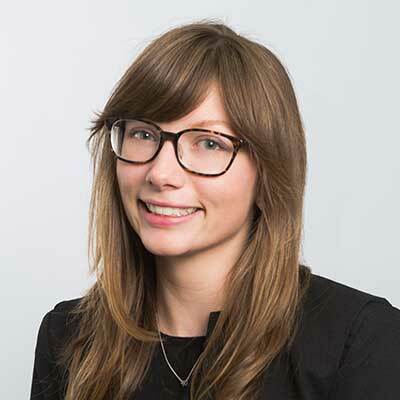 That is, the defect must not prevent the works from being used for their stated purpose, the contractor must have reasonable grounds for not promptly rectifying it, and rectification of the defect must not prejudice the convenient use of the works. If any of these criteria are not satisfied, the superintendent can refuse to grant practical completion. Whether a defect is minor, and fits within paragraph (a) of the definition, will depend on the circumstances. The focus here is not on the size of the defect itself, but rather on the effect the defect and/or its rectification may have on the convenient use of the works for their intended purpose. The same type of defect may be considered minor on one project, but not on another. The second component of the definition requires the contractor to have conducted all tests required under the contract or directed by the superintendent. These tests must be passed before practical completion can occur. The third component requires the contractor to have provided all documents and other information required under the contract and requested by the superintendent. The critical word here is ‘essential’. The contractor may be required to provide a number of different types of document under the contract. Only those that are ‘essential’ for the use, operation and maintenance of the works are required for the purposes of practical completion. The superintendent is not entitled to refuse to grant practical completion by reason of non-essential documents not having been provided. 2. How does a contractor claim practical completion? Clause 34.6 of AS 4000 requires the contractor to submit two notices in relation to practical completion. A written notice of practical completion (when the contractor is of the opinion that practical completion has been achieved). 3. What is a notice of anticipated practical completion? The contractor is required to give the superintendent notice of anticipated practical completion at least 14 calendar days prior to when the contractor anticipates it will achieve practical completion. This notice must include the date which the contractor expects that it will have satisfied all of the requirements of the above definition of practical completion. 4. What is a notice of practical completion? Once the contractor is of the opinion that the requirements of practical completion have been achieved, the contractor must submit a written notice to the superintendent. 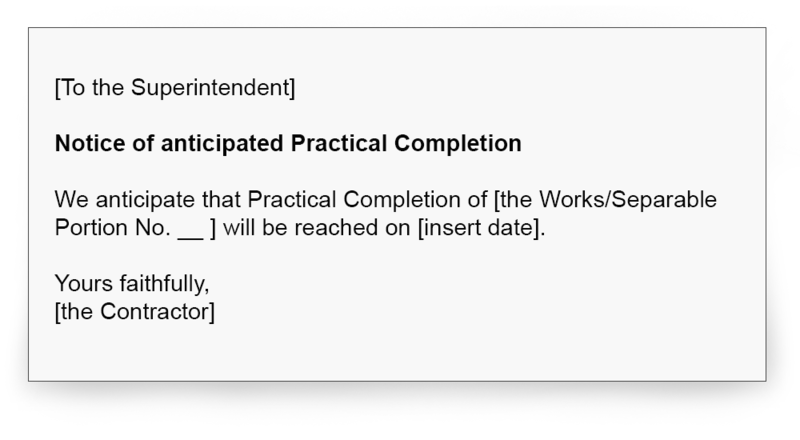 Usually this notice would be sent on the day practical completion is reached. This notice must include a request that the superintendent issue a certificate of practical completion. Below is an example of a contractor’s notice of practical completion. 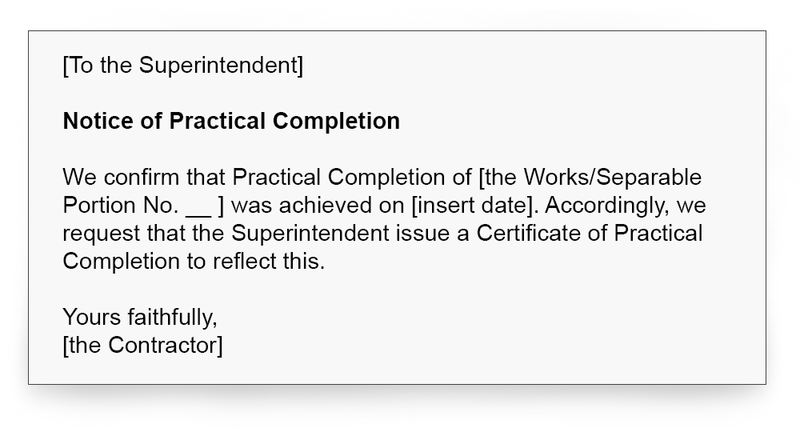 The next step is for the superintendent to issue a certificate of practical completion. 5. What is a certificate of practical completion? Within 14 calendar days of receiving the contractor’s notice of practical completion, the superintendent must either issue a certificate of practical completion or provide reasons why the superintendent is not of the opinion that practical completion has been achieved. This certificate must be issued to the contractor and the principal. If the superintendent issues reasons why practical completion has not been achieved, the contractor must address the issues raised by the superintendent. Once the contractor is of the opinion that those issues have been addressed, it must issue another notice of practical completion to the superintendent. Below is an example of a certificate of practical completion. If the superintendent is of the opinion that practical completion has been reached, the superintendent may issue a certificate of practical completion even if the contractor has not requested one. 6. What is the ‘date of practical completion’? The ‘date of practical completion’ is defined to be ‘the date evidenced in a certificate of practical completion as the date upon which practical completion was reached’. 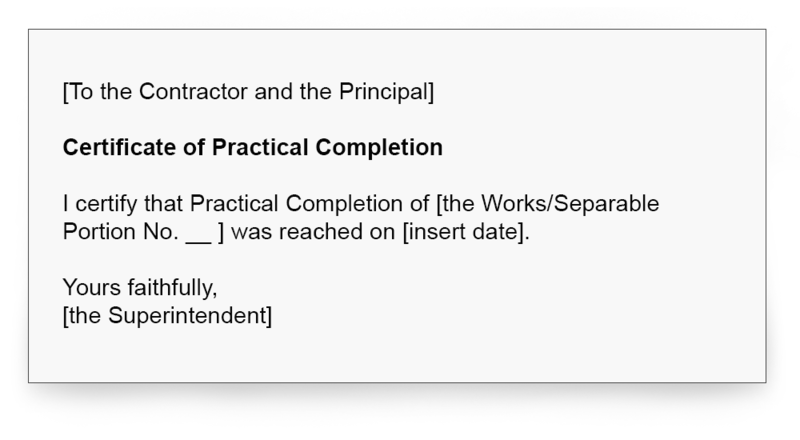 According to the NSW Court of Appeal, that wording means that the date of practical completion is the date the certificate is issued (even if the certificate states that practical completion was reached on some earlier date.) You can read more about that decision here. 7. How does practical completion operate for separable portions? Where a project involves a staged handover of separable portions, each separable portion will have its own date for practical completion. The process for practical completion outlined above applies to each separable portion. 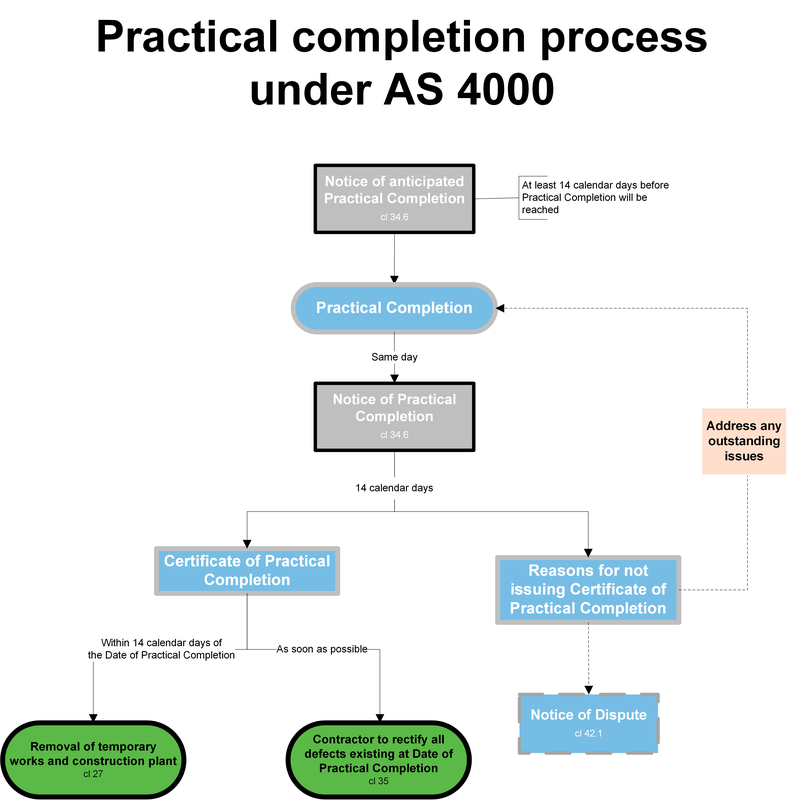 Download a print-friendly PDF copy of our flowchart on practical completion under AS 4000 here.